The Story of Noah 9 This is the account of Noah and his family. Noah was a righteous man, the only blameless person living on earth at the time, and he walked in close fellowship with God. 10 Noah was the father of three sons: Shem, Ham, and Japheth. 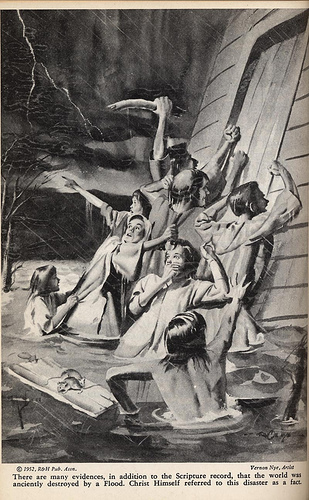 14 “Build a large boat [Traditionally rendered an ark] from cypress wood [Or gopher wood] and waterproof it with tar, inside and out. Then construct decks and stalls throughout its interior. 15 Make the boat 450 feet [138 meters] long, 75 feet wide [23 meters], and 45 feet high. [13.8 meters] 16 Leave an 18-inch opening [46 centimeters] below the roof all the way around the boat. Put the door on the side, and build three decks inside the boat—lower, middle, and upper. 1 Then God blessed Noah and his sons and told them, “Be fruitful and multiply. Fill the earth. 2 All the animals of the earth, all the birds of the sky, all the small animals that scurry along the ground, and all the fish in the sea will look on you with fear and terror. I have placed them in your power. 3 I have given them to you for food, just as I have given you grain and vegetables. [In Genesis 2: 9,16-17, 3: 17-19 God gave people the right to eat only of the plants - For the 1st time now they were being given the right to eat animals.] 4 But you must never eat any meat that still has the lifeblood in it. 3 At this, Abram fell face down on the ground. Then God said to him, 4 “This is my covenant with you: I will make you the father of a multitude of nations! 5 What’s more, I am changing your name. It will no longer be Abram. Instead, you will be called Abraham, [Abram means “exalted father”; Abraham sounds like a Hebrew term that means “father of many.”] for you will be the father of many nations. 6 I will make you extremely fruitful. Your descendants will become many nations, and kings will be among them! 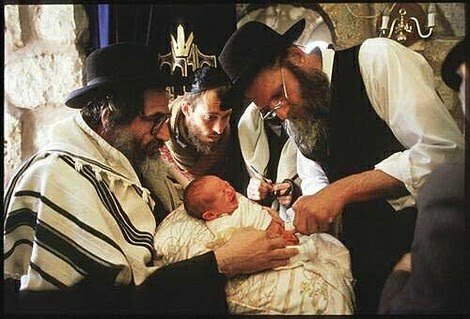 19 But God replied, “No—Sarah, your wife, will give birth to a son for you. You will name him Isaac, [Isaac means “he laughs.”] and I will confirm my covenant with him and his descendants as an everlasting covenant. 20 As for Ishmael [the son of Abraham and Hagar, Sarah's Egyptian handmaiden] I will bless him also, just as you have asked. I will make him extremely fruitful and multiply his descendants. He will become the father of twelve princes, and I will make him a great nation. 21 But my covenant will be confirmed with Isaac, who will be born to you and Sarah about this time next year.” 22 When God had finished speaking, he left Abraham. 1 These are the names of the sons of Israel (that is, Jacob) who moved to Egypt with their father, each with his family: 2 Reuben, Simeon, Levi, Judah, 3 Issachar, Zebulun, Benjamin, 4 Dan, Naphtali, Gad, and Asher. 5 In all, Jacob had seventy descendants in Egypt, including Joseph, who was already there. 11 So the Egyptians made the Israelites their slaves. They appointed brutal slave drivers over them, hoping to wear them down with crushing labor. 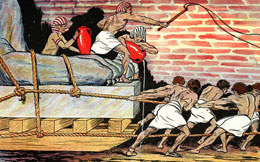 They forced them to build the cities of Pithom and Rameses as supply centers for the king. 12 But the more the Egyptians oppressed them, the more the Israelites multiplied and spread, and the more alarmed the Egyptians became. 13 So the Egyptians worked the people of Israel without mercy. 14 They made their lives bitter, forcing them to mix mortar and make bricks and do all the work in the fields. They were ruthless in all their demands. . . .
2 And God said to Moses, “I am Yahweh—‘the Lord.’[Yahweh is a transliteration of the proper name YHWH that is sometimes rendered “Jehovah”; in this translation it is usually rendered “the Lord” (note the use of small capitals).] 3 I appeared to Abraham, to Isaac, and to Jacob as El-Shaddai—‘God Almighty’ [the name for God used in Gen 17:1; 28:3; 35:11; 43:14; 48:3. ]—but I did not reveal my name, Yahweh, to them. 4 And I reaffirmed my covenant with them. 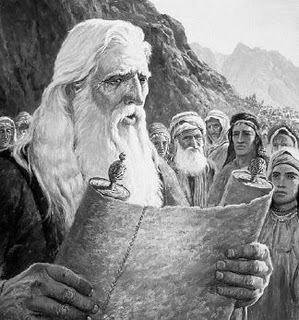 Under its terms, I promised to give them the land of Canaan, where they were living as foreigners. 5 You can be sure that I have heard the groans of the people of Israel, who are now slaves to the Egyptians. And I am well aware of my covenant with them. 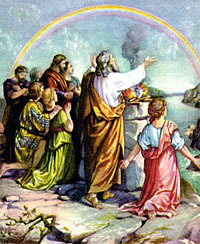 4 Then the Lord said to Moses, “Look, I’m going to rain down food from heaven for you. Each day the people can go out and pick up as much food as they need for that day. . . . 31 The Israelites called the food manna. [Manna means “What is it?” ] It was white like coriander seed, and it tasted like honey wafers. 1 Exactly two months after the Israelites left Egypt, [Hebrew In the third month after the Israelites left Egypt, on the very day, i.e., two lunar months to the day after leaving Egypt] they arrived in the wilderness of Sinai. 2 After breaking camp at Rephidim, they came to the wilderness of Sinai and set up camp there at the base of Mount Sinai. 10 “Have the people make an Ark of acacia wood—a sacred chest 45 inches long, 27 inches wide, and 27 inches high. [92 centimeters long, 46 centimeters wide, and 69 centimeters high.] 11 Overlay it inside and outside with pure gold, and run a molding of gold all around it. 12 Cast four gold rings and attach them to its four feet, two rings on each side. 13 Make poles from acacia wood, and overlay them with gold. 14 Insert the poles into the rings at the sides of the Ark to carry it. 15 These carrying poles must stay inside the rings; never remove them. 16 When the Ark is finished, place inside it the stone tablets inscribed with the terms of the covenant, [Hebrew Place inside the Ark the Testimony; similarly in 25:21. The Hebrew word for “testimony” refers to the terms of the Lord’s covenant with Israel as written on stone tablets, and also to the covenant itself.] which I will give to you. 17 “Then make the Ark’s cover—the place of atonement—from pure gold. It must be 45 inches long and 27 inches wide. [115 centimeters long and 69 centimeters wide] 18 Then make two cherubim from hammered gold, and place them on the two ends of the atonement cover. 19 Mold the cherubim on each end of the atonement cover, making it all of one piece of gold. 20 The cherubim will face each other and look down on the atonement cover. With their wings spread above it, they will protect it. 21 Place inside the Ark the stone tablets inscribed with the terms of the covenant, which I will give to you. Then put the atonement cover on top of the Ark. 22 I will meet with you there and talk to you from above the atonement cover between the gold cherubim that hover over the Ark of the Covenant. [Or Ark of the Testimony] From there I will give you my commands for the people of Israel. 31 “For the inside of the Tabernacle, make a special curtain of finely woven linen. Decorate it with blue, purple, and scarlet thread and with skillfully embroidered cherubim. 32 Hang this curtain on gold hooks attached to four posts of acacia wood. Overlay the posts with gold, and set them in four silver bases. 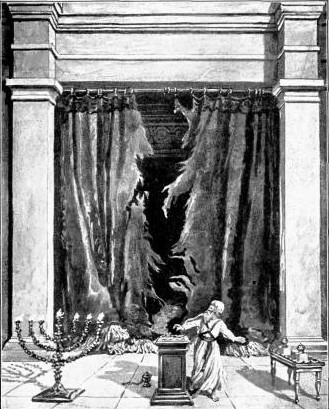 33 Hang the inner curtain from clasps, and put the Ark of the Covenant [Or Ark of the Testimony] in the room behind it. This curtain will separate the Holy Place from the Most Holy Place. 18 When the Lord finished speaking with Moses on Mount Sinai, he gave him the two stone tablets inscribed with the terms of the covenant, written by the finger of God. 15 Then Moses turned and went down the mountain. He held in his hands the two stone tablets inscribed with the terms of the covenant. They were inscribed on both sides, front and back. 16 These tablets were God’s work; the words on them were written by God himself. 19 When they came near the camp, Moses saw the calf and the dancing, and he burned with anger. 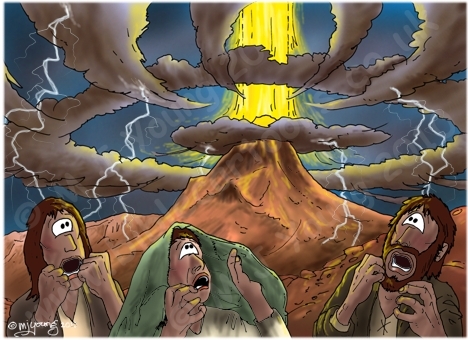 He threw the stone tablets to the ground, smashing them at the foot of the mountain. 20 He took the calf they had made and burned it. Then he ground it into powder, threw it into the water, and forced the people to drink it. 18 “You must celebrate the Festival of Unleavened Bread. 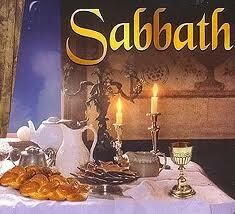 For seven days the bread you eat must be made without yeast, just as I commanded you. Celebrate this festival annually at the appointed time in early spring, in the month of Abib, [This first month of the ancient Hebrew lunar calendar usually occurs within the months of March and April] for that is the anniversary of your departure from Egypt. 19 “The firstborn of every animal belongs to me, including the firstborn males from your herds of cattle and your flocks of sheep and goats. 20 A firstborn donkey may be bought back from the Lord by presenting a lamb or young goat in its place. But if you do not buy it back, you must break its neck. However, you must buy back every firstborn son. 22 “You must celebrate the Festival of Harvest [Hebrew Festival of Weeks; This was later called the Festival of Pentecost. It is celebrated today as Shavuat (or Shabuoth). ] with the first crop of the wheat harvest, and celebrate the Festival of the Final Harvest [Or Festival of Ingathering. 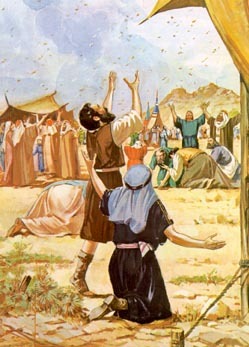 This was later called the Festival of Shelters or Festival of Tabernacles (see Lev 23:33-36). It is celebrated today as Sukkot (or Succoth)] at the end of the harvest season. 23 Three times each year every man in Israel must appear before the Sovereign, the Lord, the God of Israel. 24 I will drive out the other nations ahead of you and expand your territory, so no one will covet and conquer your land while you appear before the Lord your God three times each year. 29 When Moses came down Mount Sinai carrying the two stone tablets inscribed with the terms of the covenant, he wasn’t aware that his face had become radiant because he had spoken to the Lord. 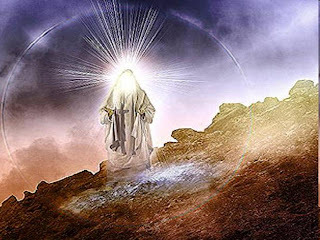 30 So when Aaron and the people of Israel saw the radiance of Moses’ face, they were afraid to come near him. 11 “Do not use yeast in preparing any of the grain offerings you present to the Lord, because no yeast or honey may be burned as a special gift presented to the Lord. 12 You may add yeast and honey to an offering of the first crops of your harvest, but these must never be offered on the altar as a pleasing aroma to the Lord. 13 Season all your grain offerings with salt to remind you of God’s eternal covenant. Never forget to add salt to your grain offerings. 3 “When Aaron enters the sanctuary area, he must follow these instructions fully. He must bring a young bull for a sin offering and a ram for a burnt offering. 4 He must put on his linen tunic and the linen undergarments worn next to his body. He must tie the linen sash around his waist and put the linen turban on his head. These are sacred garments, so he must bathe himself in water before he puts them on. 5 Aaron must take from the community of Israel two male goats for a sin offering and a ram for a burnt offering. 6 “Aaron will present his own bull as a sin offering to purify himself and his family, making them right with the Lord. [Or to make atonement for himself and his family; similarly in 16:11, 17b, 24, 34.] 7 Then he must take the two male goats and present them to the Lord at the entrance of the Tabernacle. [Hebrew Tent of Meeting; also in 16:16, 17, 20, 23, 33.] 8 He is to cast sacred lots to determine which goat will be reserved as an offering to the Lord and which will carry the sins of the people to the wilderness of Azazel. 9 Aaron will then present as a sin offering the goat chosen by lot for the Lord. 10 The other goat, the scapegoat chosen by lot to be sent away, will be kept alive, standing before the Lord. When it is sent away to Azazel in the wilderness, the people will be purified and made right with the Lord. 11 “Aaron will present his own bull as a sin offering to purify himself and his family, making them right with the Lord. After he has slaughtered the bull as a sin offering, 12 he will fill an incense burner with burning coals from the altar that stands before the Lord. Then he will take two handfuls of fragrant powdered incense and will carry the burner and the incense behind the inner curtain. 13 There in the Lord’s presence he will put the incense on the burning coals so that a cloud of incense will rise over the Ark’s cover—the place of atonement—that rests on the Ark of the Covenant. If he follows these instructions, he will not die. 14 Then he must take some of the blood of the bull, dip his finger in it, and sprinkle it on the east side of the atonement cover. He must sprinkle blood seven times with his finger in front of the atonement cover. 15 “Then Aaron must slaughter the first goat as a sin offering for the people and carry its blood behind the inner curtain. There he will sprinkle the goat’s blood over the atonement cover and in front of it, just as he did with the bull’s blood. 16 Through this process, he will purify [Or make atonement for; similarly in 16:17a, 18, 20, 27, 33.] 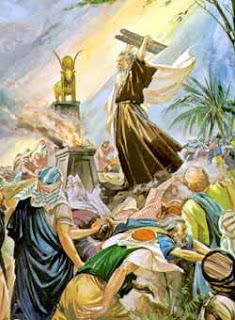 the Most Holy Place, and he will do the same for the entire Tabernacle, because of the defiling sin and rebellion of the Israelites. 17 No one else is allowed inside the Tabernacle when Aaron enters it for the purification ceremony in the Most Holy Place. No one may enter until he comes out again after purifying himself, his family, and all the congregation of Israel, making them right with the Lord. Whenever Moses went into the Tabernacle to speak with the Lord, he heard the voice speaking to him from between the two cherubim above the Ark’s cover—the place of atonement—that rests on the Ark of the Covenant. The Lord spoke to him from there. 1 Now the Lord said to Moses, 2 “Make two trumpets of hammered silver for calling the community to assemble and for signaling the breaking of camp. 3 When both trumpets are blown, everyone must gather before you at the entrance of the Tabernacle. [Hebrew Tent of Meeting.] 4 But if only one trumpet is blown, then only the leaders—the heads of the clans of Israel—must present themselves to you. . . .
11 In the second year after Israel’s departure from Egypt—on the twentieth day of the second month [This day in the ancient Hebrew lunar calendar occurred in late April, May, or early June. ]—the cloud lifted from the Tabernacle of the Covenant. 12 So the Israelites set out from the wilderness of Sinai and traveled on from place to place until the cloud stopped in the wilderness of Paran. . . .
14 “Everything in Israel that is specially set apart for the Lord also belongs to you. 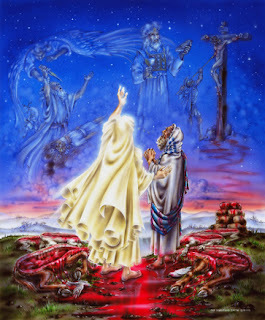 15 “The firstborn of every mother, whether human or animal, that is offered to the Lord will be yours. But you must always redeem your firstborn sons and the firstborn of ceremonially unclean animals. 16 Redeem them when they are one month old. The redemption price is five pieces of silver[ 5 shekels [2 ounces or 57 grams] ] (as measured by the weight of the sanctuary shekel, which equals twenty gerahs). 1 While the Israelites were camped at Acacia Grove, [Hebrew Shittim.] some of the men defiled themselves by having sexual relations with local Moabite women. 2 These women invited them to attend sacrifices to their gods, so the Israelites feasted with them and worshiped the gods of Moab. 3 In this way, Israel joined in the worship of Baal of Peor, causing the Lord’s anger to blaze against his people. 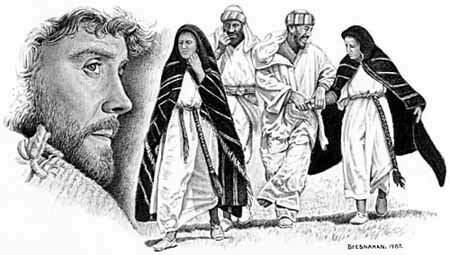 6 Just then one of the Israelite men brought a Midianite woman into his tent, right before the eyes of Moses and all the people, as everyone was weeping at the entrance of the Tabernacle. 7 When Phinehas son of Eleazar and grandson of Aaron the priest saw this, he jumped up and left the assembly. He took a spear 8 and rushed after the man into his tent. Phinehas thrust the spear all the way through the man’s body and into the woman’s stomach. So the plague against the Israelites was stopped, 9 but not before 24,000 people had died.